In January of this year, Christine Tortora reiterated her and Helping Hands’ support to the hospital. Following Juliette Sushila Ghatradyal’s conference during a yoga workshop organized by Simone Audisio, Christine Tortora, touched by our actions, decided to help us by committing herself as Helping Hands’ correspondant. Thanks to her enthusiasm and her trust, she has been walking along F.I.K. for 5 years now. 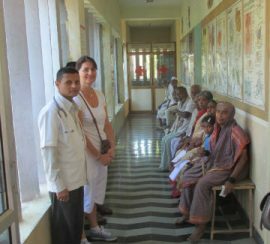 On March 11th, 2016, she went to Halligudi in order to pay a visit to our projects. Thank you Christine, thank you Helping Hands! 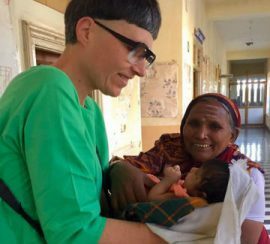 F.I.K.’s president, Juliette Sushila Ghatradyal, went back to India in early January with Jérôme Poggi and Eve Lemesle. Both of them work as mediators for the Action Nouveaux Commanditaires, which is part of the Fondation de France. They went with Matali Crasset, a famous designer in France. Once there, they met the inhabitants and the hospital’s staff, in order to carry out a study for the nursery project. Matali Crasset accepted to support us and to think of a building that would be adapted to local needs and traditions. She previously designed the Maison des Petits at the 104, in Paris. She drew inspiration from Françoise Dolto’s Maisons Vertes, created in 1979 and thought of as places of transition between family and the public space, as well as places of socialization for young children between 0 and 3. Children, a priority for F.I.K. 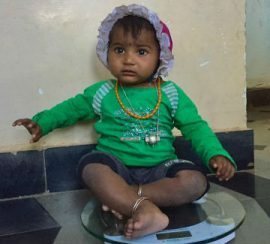 In order to celebrate the new year, we organized a pediatric camp thanks to Doctor Gojnur and Doctor Patil’s help, and with the participation of the generous paediatricians Sandjeev Joshi, Rajshekhar Patel and Basayaraj Nimbannavar. A beautiful day under the smiles of 200 young patients. At 10am, corridors got to be filled with vivid colours, as young women sat down on the floor, their babies on their legs, and after having registered at the reception desk. With gentleness and professionalism, the children could be diagnosed, treated, and leave the hospital with the medicine adapted to their needs and offered by our volunteer doctors. Like every year, the president went to India in order to follow-up with projects achieved in 2016, to work with the local staff and to renew the partnership with the Indian Committee. 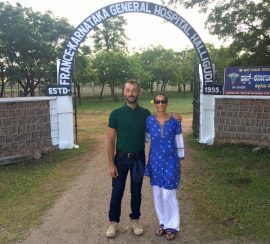 During her stay, she introduced Jérôme Poggi and Eve Lemesle to Halligudi village and to the nursery project, on which we currently focus. In 2004, Jérôme Poggi creates SOCIETIES in order to implement, among other, the Action Nouveaux Commanditaires in Paris and its suburbs, supported by the Fondation de France. The project aims at bringing together the capacities of civil society members who wish to interact on the artistic scene and, together, create a piece of art. Along with several partners, SOCIETIES experiments new forms of dialogue between arts and society, overcoming institutions and financial markets’ conventional frameworks. Our nursery project has been selected to benefit from this initiative. The president also attended the 9th anniversairy of the founder’s disappearance. The Filliozat went to India specially for the event. 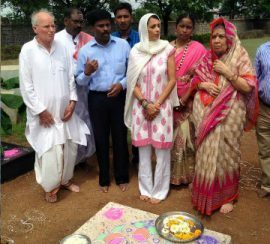 Many family members and inhabitants attended the ceremony. The founder’s memorial is located on the hospital campus, which he created more than 20 years ago in this rural area where he comes from.